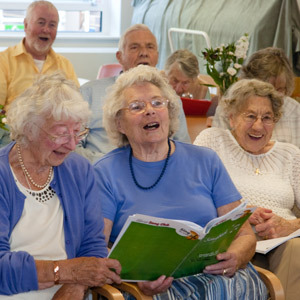 Singing is a workout – For the elderly, disabled, and injured, singing can be an excellent form of exercise. Even if you’re healthy, your lungs will get a workout as you employ proper singing techniques and vocal projections. Other related health benefits of singing include a stronger diaphragm and stimulated overall circulation. Since you pull in a greater amount of oxygen while singing than when doing many other types of exercise, some even believe that singing can increase your aerobic capacity and stamina. Singing helps with sleep – experts believe singing can help strengthen throat and palate muscles, which helps stop snoring and sleep apnea. If you’re familiar with these ailments, you know how difficult it can be to get a good night’s sleep! Singing is a natural anti-depressant – Singing is known to release endorphins, the feel-good brain chemical that makes you feel uplifted and happy. Singing lowers stress levels Singing releases stored muscle tension and decreases the levels of a stress hormone called cortisol in your blood stream. Singing improves mental alertness Improved blood circulation and an oxygenated blood stream allow more oxygen to reach the brain. This improves mental alertness, concentration, and memory. The Alzheimer’s Society has even established a “Singing for the Brain” service to help people with dementia and Alzheimer’s maintain their memories. one of the unexpected health benefits of singing is that it can improve your social life. The bonds you form singing with others can be profound, since there’s a level of intimacy naturally involved. Tuesday 10.30am Cornmill House, King Edward Avenue.